There was a time earlier in her career, Andrea Dezsö recalls, when people told her that if she wanted to succeed as an artist, she needed to find something to specialize in — and to stick with it. That idea never appealed to her, though. The Amherst artist and Hampshire College art professor has long made good on that goal. From multiple arts residencies to public art commissions, she has worked in drawing, painting, ceramic sculpture, cut paper, embroidery, animation and large site-specific installations. She has illustrated and helped design children’s books, worked with cut glass and exhibited her work around the world, from France and Switzerland to Japan and South Korea. She even has designed an album cover for the pop singer-songwriter Aimee Mann — the 2017 acoustic record “Mental Illness” — and written for art publications and graphic stories. And late this year or early next year, Dezsö’s newest public art exhibit — 14 glass mosaic murals based on her drawings — will be installed in a subway station in Brooklyn, New York. It’s the third mosaic she has designed for the New York subway system — one was of stainless steel, another of glass — and the latter was voted the Best American Public Art project in 2007. Dezsö, who was born in Romania but grew up in a family of predominantly Hungarian ancestry, has a low-key approach to life; she seems to take her success in stride. In a recent interview in her rented home, where she has a modest studio space, she noted that she and her husband, Adam Gurvitch, have spent most of the past several summers traveling, or as part of her artist residencies. Dezsö is particularly known for her illustrations and paintings, including for book covers and newspapers like The New York Times, where she has contributed drawings for the editorial page and the Sunday Book Review. She has been nominated a number of times in recent years as an illustrator for the international Astrid Lindgren Memorial Award for children’s literature. Dezsö, who was born in 1968, says she began drawing and painting as a child and never stopped, in part because growing up in then-communist Romania, there wasn’t the same focus on entrepreneurial success or professional careers with big incomes as there is in the United States. She faced a different kind of hurdle, though, after attending an art high school in Cluj, the principal city of Transylvania, the section of Romania where she grew up. Transylvania had once been part of the Austro-Hungarian Empire, then Hungary, and there had long been tensions between Hungarians and Romanians. Dezsö did not win acceptance to the one art college in Transylvania, which she suspects was because of her primarily Hungarian ancestry (she also has some Italian, Croatian, Jewish and Romanian background). Instead, after a few years of trying to get permission to leave Romania, she went to the Moholy-Nagy University of Art and Design in Budapest, Hungary in 1989, where she initially wanted to study ceramics. Not having any money for ceramic supplies or a studio, though, she focused on graphic design and typography, with a concentration on children’s books. Dezsö earned both an undergraduate and graduate degrees in art in Hungary, where she also met Adam, then working for the Peace Corps. The couple, along with Dezsö’s young son, Mark Bosz, from a previous relationship, came to New York in 1996 to see Adam’s family, and Dezsö took her portfolio to the Center for Book Arts in Manhattan. She walked out with a one-year artist’s residency. “That was how I came to America,” she said. Over the years, Dezsö has taught art in a number of places, including the Parsons School of Design in New York; the family lived in Queens for many years. But in 2010, she visited this region with Mark, by then a high school senior, for some college visits, and while checking out Hampshire College, “I fell in love with it,” she said. Happily for Dezsö, a position at Hampshire opened up in 2011, and she has taught there ever since. Meanwhile, Mark attended the University of Massachusetts Amherst for one year, then transferred to Hampshire, where he studied animation, music composition and web design; he now lives in New York and teaches at the Museum of the Moving Image, among other things. Living in the Valley, says Dezsö, has given her closer access to nature, which, along with folklore, is one of the biggest inspirations for her art. “I love the colors you can find in nature and the sense of mystery and adventure,” she noted. You can see that in many of her highly detailed drawings, such as “The Mountain,” a mix of black ink and colored marker that she says took her months to complete. The glass mosaic designs for the New York city subway stations are also studies in bright colors, like the imaginary fruits, huge insects and giant cats she designed for the murals at a station near Lehman College in the Bronx, in 2007. 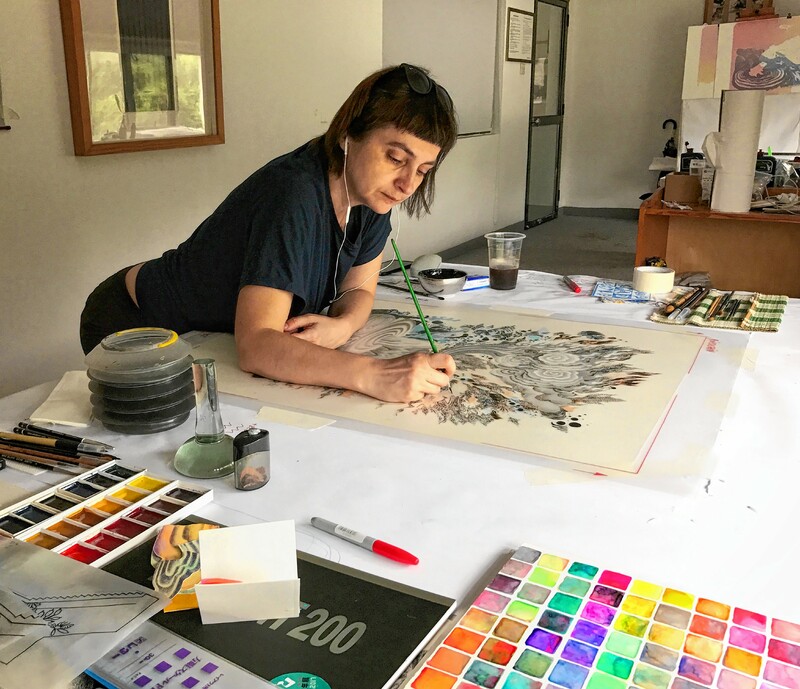 For that project and the new one she’s working on, she created drawings with colored pencils that are translated into glass mosaics by a company in Italy, from a scale of about half an inch to a foot. “That’s one of the things I most like about this project, this ability to play with scale,” said Dezsö, who notes that the Italian company is able to recreate her drawings in great detail, even mimicking the brushstrokes of her colored pencils. Dezsö has also been working on illustrations of books for adults, a new series by Princeton University Press called “Oddly Modern Fairy Tales.” In fact, she’s always working on something, a drive she traces in part to her first visit to the library at Moholy-Nagy University of Art and Design in Budapest, where the stacks and stacks of books were a stark contrast to the lack of reading material available in Romania, due to censorship. Andrea Dezsö’s website is andreadezso.com.